Relationships are primary in small congregations. Those of us who have experienced the blessings of life together in a small church often ask how other people get along without the close relationships that we cherish. It turns out that healthy peer relationships are key for changing human behavior in general and for solving problems that seem intractable. 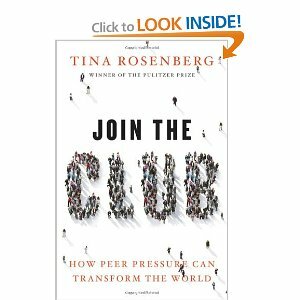 Recently I read an important book entitled Join the Club: How Peer Pressure Can Transform the World. Author Tina Rosenberg tells stories drawn from across the world and from across domains: medical, social, political and spiritual. She shows how positive peer power can help people practice healthier life habits and follow medical regimens, develop sources of income, leave gangs and terrorist cells, bring down dictators—Slobodan Milosevic in this case—and help people draw closer to God. Rosenberg includes a lengthy chapter chronicling the struggle of a megachurch, Willow Creek, to create true community in small groups where people actually are a part of one another’s everyday lives, encouraging each other to go deeper in love of God and neighbor. The results have been mixed. The author describes in detail one of Willow Creek’s successful groups, which is really a minichurch inside the megachurch. I found myself having a new compassion for large churches, who have to work so hard to develop what comes naturally in a healthy small congregation. In the small churches I’ve been a part of, I’ve seen the positive difference good relationships can make. It was inspiring to read so many preachable examples of the power of community in Join the Club. It’s a very long book, so you may not have time to read it. Just keep it in mind for future reference. Meanwhile, this book reminds us to look at our own communities. Are we drawing closer to God and maturing as disciples? Are we influencing one another in a positive way? And are we turning outward to form community with others? Join the Club is food for thought as we discern how to do that.